This Sunday we celebrate St George’s Day. A day of celebration. Friends getting together and enjoying a good St George’s Day lunch which always includes Roast Beef and Yorkshire puddings. St George’s day was celebrated in St George’s Crypt up until the closure of Oxford Prison in 1996. As a Detective I would often attend Oxford Prison to lecture to the staff on current drug trends. During one of my visits, I was invited by the Governor on a private tour around what is now Oxford Castle Unlocked. We climbed St George’s Tower to observe awesome views of the City of Dreaming Spires. We then went down to St George’s Crypt, the only remaining part of St George’s Chapel following its destruction in the 16th Century. The Crypt is beautiful, cool, serene. Some find it ghostly. 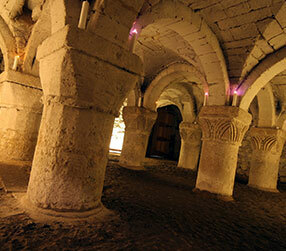 There are four original pillars still here built by expert craftsmen in 1074. My guide, a Prison Officer, informed me that every St George’s Day, the Bishop of Oxford would come down to the Crypt in the morning to commemorate the Great Saint. He was joined by the Lord Mayor of our City. After a short service, the party would adjourn fora breakfast. Although my guide did not believe the crypt was haunted, he did inform me that one year there was a lady councillor who was blind. She had with her a guide dog. The dog refused to enter the crypt. I was told this could be because of the atmosphere in the crypt, the darkness or perhaps the animal sensed a presence of something. So is the crypt haunted? The only way to know this is to come and see, come on a tour. I find the crypt a beautiful part of the tour, I am amazed that we can still touch the four pillars expertly built by craftsmen using only a hammer and chisel centuries ago. 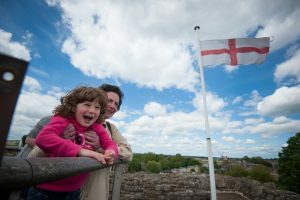 I suggest that if you want to visit the crypt to come and see us, take in the atmosphere, why not choose St George’s Day to celebrate the day. I also strongly recommend that when your guide leaves you in our Exhibition Centre, you are more than welcome to return to the Crypt. Just stand there, take in the atmosphere and record your visit by taking a photo of this beautiful room. Whatever you do, have a great St George’s Day this Sunday.